Arthur Devis is one of the best-known painters of ‘conversation pieces’, small-scale informal portraits of groups in idealised landscapes or interiors. Devis’s portraits of country gentry are a fascinating record of Georgian domestic life, fashion, and manners. 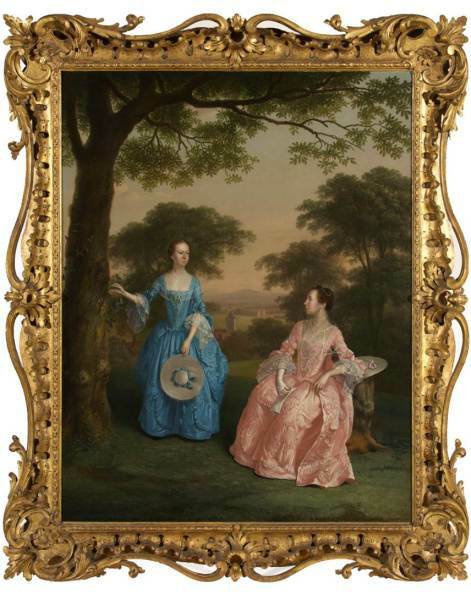 This image of the middle-aged Clarke sisters of Walford Court, Ross-on-Wye, is particularly unusual as it depicts women as landowners. They inherited their estate from the philanthropist John Kyrle. The landscape background overlooks the river Wye and a village church.